I am tapping away writing this in total lazy mode – it’s 6:53am and I’m propped up in bed with my second massive mug of tea – perfect! Today’s recipes are two that I put together for Fairfax, and they are two family favourites – basically we have pizza at home probably around once a week – sometimes with homemade pizza bases, sometimes, bought ones (good thin crispy ones), but always the toppings are super-simple combinations of just a few ingredients. Rich loves salmon, so his fave is the smoked salmon, dill & caper combo (actually everyone loves it!) and at this time of year it is a treat to make good use of fresh, tender asparagus – beautiful with a little Parmesan, some milky mozzarella, a few basil leaves, sea salt and a good grinding of black pepper. The critical thing to making perfect thin, crispy pizzas is to heat your oven, and oven trays up to super-hot – then slide your pizza bases onto the hot trays so that the base starts cooking immediately. These are definitely a couple of my ‘go-to’ recipes that look and taste great, and easily feed a crowd. PS – if you’ve just arrived via My Domain – welcome – and please feel free to pop into the home page and have a good fossick around the blog while you’re here! Mix flour and salt together in the bowl of a big mixer or a big bowl. Put water in a jug, whisk in sugar then gently stir in yeast and leave to sit 5 minutes until the mix has a frothy top. Stir into flour with olive oil, then either mix by hand, or use a mixer with a dough hook to bring the dough together and knead for 5 minutes (longer by hand – tip out of the bowl and give it at least 10 minutes of kneading) until it is smooth and elastic. Put into a bowl greased with a little extra olive oil, cover with plastic wrap and leave to sit in a warmish spot for 45 minutes. Remove from the bowl, knock the air out and knead a minute or two further. If the dough feels sticky, knead lightly on a floured bench until flour is incorporated and dough feels smooth. Separate into two even pieces and roll into two balls then place in two ziplock plastic bags and pop in the freezer for at least 2 hours, which really helps to ‘settle’ it. You can now use the dough or refrigerate it again, or freeze it until you are ready to use it. Each of the two balls will make two pizzas. Cut each ball of dough into two pieces. Trim 4 pieces of baking paper to the size of your oven trays. Heat the oven to 250˚C and put two oven trays in to heat up (or use a pizza oven and/or pizza stones if you have them). Roll the dough out directly onto the baking paper, into large, thin rectangles. Sprinkle the grated mozzarella and Parmesan over the pizza bases. Top two with smoked salmon pieces and two with asparagus spears. Tear mozzarella into tablespoon sized chunks and dot over pizzas and season with salt and pepper. Carefully slide two prepared pizzas onto very hot oven trays and cook 12-15 minutes until golden. 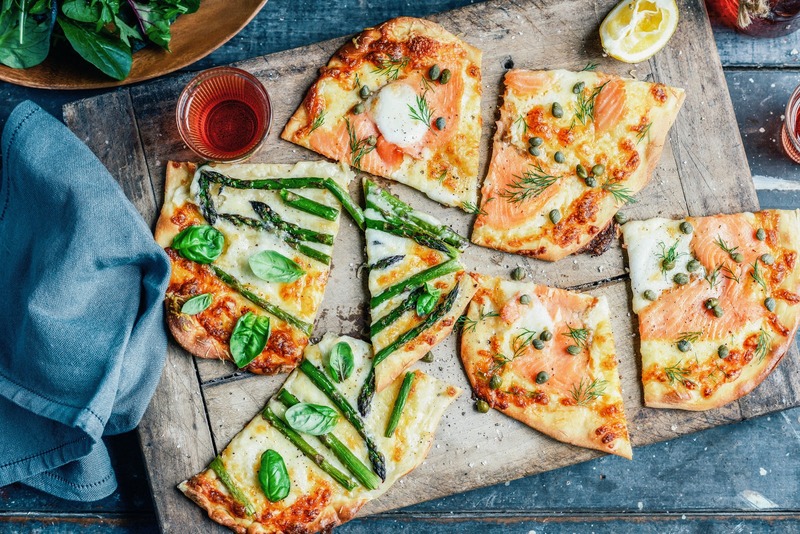 Sprinkle salmon pizzas with capers and dill, and asparagus pizzas with basil leaves. To serve. Repeat with remaining pizzas. Serves 8-10 with a simple green salad. What glorious looking pizzas. 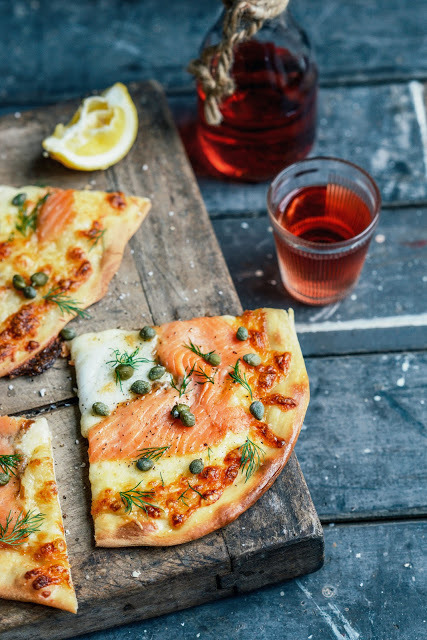 I love making home made pizza but have never thought to put smoked salmon on, why have I not done this before?! Thank you for this. Great pizza! 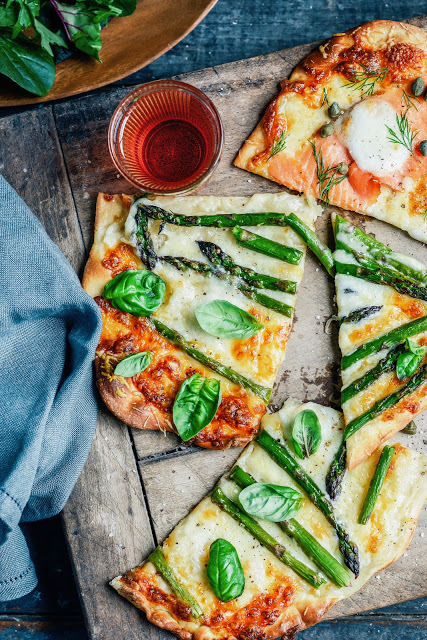 I made this for one of our Friday night pizzas…salmon and asparagus great combo! Thank you!